Need to find the date your Rickenbacker was made? You've come to the right place. Like many other guitar brands, Rickenbacker dating techniques get significantly easier the closer you get to the present. 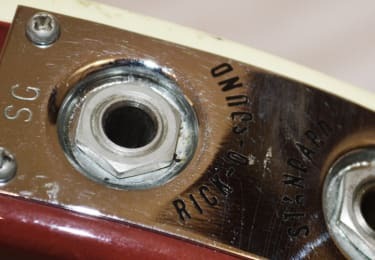 While the earliest Rickenbacker instruments are virtually impossible to date via serial number, finding the year of a newer Rickenbacker takes just seconds. Take a look at the info below on how to identify the year of a Rickenbacker from various periods of the company's history. Prior to 1954, the serial numbers do not serve as a direct indicator of the date of the instrument. Some instruments do have patent numbers on various parts, which provide some clues since the instrument will have been made after the date of the patent issue. For Ricks of this era, it's best to use resources like our Price Guide to get a general sense of what different instruments from the period look like. Starting in 1954, Rickenbacker introduced a series of serial number formats that can reveal the approximate year of production of a specific instrument. Generally with this system, the first digits before the letter indicate the model series, such as 6 for 600 model guitar. The first letter indicates the type of instrument such as B for bass, C for combo (a style of Rick guitar) or M for mandolin. The number right after the letter is the last digit of the year such as 6 for 1956. The last three digits mark where it fell in the production run of that specific model. As an example, if your serial number was 4C7768, you would have a 400-series Combo from 1957. In this era, the serial number can either be found on the jackplate (the plate surrounding the input jack) or on the bridge of the instrument. Smaller-bodied Rickenbacker guitars follow a similar format (starting with a V) but do not have a first number before the letter. As with other models, the first number after the letter in the serial indicates the last digit of the year. For example, V6999 would indicate a 1956 year of production. Hollowbody and semi-hollow guitars made from 1958 till October 1960 begin with a two or three-digit prefix that indicates number of pickups and other features. The format is either a 2 or 3 for the first digit (indicating number of pickups) followed by a T for standard tailpiece or V for a vibrato tailpiece and then the production sequence number. Dating a Rickenbacker produced between 1960 and 1986 is comparatively easy. If you look at the jackplate, you'll see two letters above the input jack. The first letter is the year and the second is the month. In the example shown here, 'S' indicates 1979 and 'G' indicates July. So this Rickenbacker was made in July of 1979. There is one key exception to this: the letter J can indicate either 1970 or 1960. Given how much Rickenbacker models changed in the '60s though, simply assessing the features of an instrument can tell you in which of the two years it was made. Take a look at Rickenbacker in our Price Guide for information on specific models. The month codes for this era are exactly the same as used in the previous era. For a breakdown of which letters correspond to each month, see above. After 1996, there was a a bit of a hiccup in which Rickenbacker reused '0' for 1997 and '1' for 1998. The month format jumped a few letters forward in the alphabet, ranging from 'M' through 'Y.' This means that 'M' represents January and 'N' represents February. Rickenbacher skipped 'O,' likely to avoid confusion with the '0' representing 1997, so 'P' represents March, 'R' represents April, and so on. Things get even easier after 1998 when Rickenbacker simply started using the last two digits of the year to show when each instrument was made in place of the previous code. For example, if you look at a jack plate and see a 10 above the input jack, that'd be an instrument made in 2010.